The title sounds almost poetic, doesn't it? But poetry is not the point of today's blog, but rather a very surprising happening. Out of the blue, Mr. Art Reitmayer, has become the EX CEO of the Rick Hansen Foundation after less than one year (I imagine that the two weeks short of one year is probably the time off he was supposed to have). What happened? Was one year the original plan? Why has no announcement been made? The RHF website is now missing a CEO on their executive team, and they are currently hunting for a new CEO. Sounds sudden to me. Mr. Reitmayer was the only one sending us answers (or non-answers as I like to call them) to our questions. Even when the questions were sent to Mr. Hansen personally, the only person that responded was the ex CEO, which I must admit makes me a little worried about future answers. But he did send me one more email before he left. It wasn't a 'dear Dennis' letter telling me how much he'd miss me and all our questions. He didn't write to wish me a hearty sayonara. Heck, he didn't even tell me he was leaving. He did send us some more pieces to our puzzle about their spending. 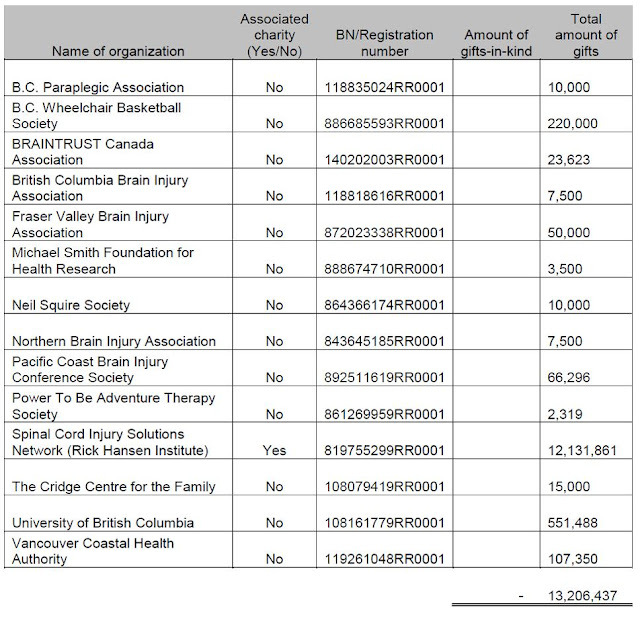 RHF makes a lot of grants to external organizations and there is no public information on who gets how much, just a list of the different organizations and a total of the donations to all the different groups. So, Mr. Reitmayer was able to provide this to us. Of course he didn't answer our big question about spending on CHRONIC SPINAL CORD INJURY, but his last answer did give us a few more pieces. The biggest amount goes to the Rick Hansen Institute, but without them telling us what RHI is spending on, we have now way of knowing if chronic spinal cord injury is part of the spending. I'm starting to feel that they're not spending on chronic spinal cord injury or of course that they'd tell us and look like super stars. Anyhow, you be the judge of their spending on a cure for paralysis. The chart is below and an updated version of my complete Q&A based on their 2010 annual report can be found here. Happy hunting and I promise that we are not done! Finally the community has their own voice and is sorting through the hype. Keeping an eyeball on researcher's over hype and funding foundations that are not transparent is a step in the right direction. In the past you would get thrown off a forum for asking the tough questions. RHI's spending looks appropriate and valid. The research priorities (translational research, best practices and the SCI registry) are excellent steps towards an eventual cure. Really, the SCI registry. There already are two registries. One in America and one in Europe. Do Canadians have different types of SCI. Translational research? It's a great thing, so when we ask what they're translating with chronic sci, or what future products they're thinking about with chronic sci, nothing, no answer. You just can't say "we do translation", they got to tell us what they're translating.